Hostage [Bishop: Special Crimes Unit] Kay Hooper Paranormal Thriller. Condition is Like New. Shipped with USPS Media Mail. Kay Hooper. by Kay Hooper. THIS HARDCOVER IS. FIRST EDITION: AUGUST 2012. Borders by isdtnek. ISBN 978-0-425-25874-3. WE ACCEPT MOST MAJOR CREDIT and DEBIT CARDS. ISBN : 0425280721. Authors : Hooper, Kay. Binding : Hardcover. Product Category : Books. Condition : Good. List Price (MSRP) : 26.95. Publication Date : 2015-10-20. Publisher : Berkley. ISBN : 0425258742. Authors : Hooper, Kay. Binding : Hardcover. Publisher : Berkley Hardcover. Product Category : Books. Condition : Good. List Price (MSRP) : 26.95. Publication Date : 2012-07-31. Format: Hardcover Condition: New! Other notes Item Details. Trending at C $5.40eBay determines this price through a machine-learned model of the product's sale prices within the last 90 days. Trending at C $4.81eBay determines this price through a machine-learned model of the product's sale prices within the last 90 days. Hold Back The Dark by Kay Hooper Hardcover Book Free Shipping! Hold Back The Dark by Kay Hooper. Author Kay Hooper. It will take all their training, all their experience, and every extra sense they can call on to get to the bottom of things in Prosperity. Title Hold Back The Dark. 5 out of 5 stars - Hold Back The Dark by Kay Hooper Hardcover Book Free Shipping! 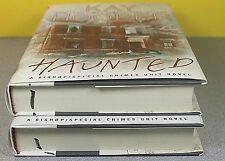 1 product rating1 product ratings - Hold Back The Dark by Kay Hooper Hardcover Book Free Shipping! A Deadly Web by Kay Hooper (English) Library Binding Book Free Shipping! A Deadly Web by Kay Hooper. KAY HOOPER is the award-winning author of Sleeping with Fear, Stealing Shadows, and more than ten other novels of suspense and intrigue along with dozens of other books. She lives in North Carolina. ISBN : 0425259374. Authors : Hooper, Kay. Binding : Hardcover. Product Category : Books. Condition : Good. List Price (MSRP) : 26.95. About COAS Books. Publication Date : 2013-11-26. Hold Back The Dark by Kay Hooper. 5 out of 5 stars - Hold Back The Dark by Kay Hooper. 1 product rating1 product ratings - Hold Back The Dark by Kay Hooper. Authors : Hooper, Kay. Binding : Hardcover. Product Category : Books. Condition : Good. List Price (MSRP) : 26.95. Publisher : Berkley. Different: She was running. Trying to escape. Another dead girl… Emma Rayburn was born and raised in Baron Hollow, North Carolina, and it was a quiet life. Until her sister arrives. Unresolved issues from Jessie's past have not only kept them apart but have been clouding Jessie's unique abilities. Kay Hooper's. I don't belong to a book club. Hold Back the Dark. Like new, read once. Up for sale. It has never been read. Scoop it up while it lasts!! Author(s): Hooper, Kay. Condition: Good. Binding: Hardcover. Publisher: Berkley Hardcover. Product Category: Books. Author(s): Hooper, Kay. Title: A Deadly Web. Condition: Good. Publisher: Center Point. Product Category: Books.